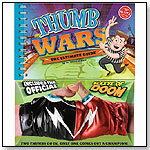 To bring thumb wrestling to the next level, Klutz invented the Sleeve of Doom, a sleek, shiny, and sensational instrument of combat. Two contenders slide their hands in and clasp them together, poking their thumbs through the holes for an even playing field. The book covers everything from classic challenges, strategies, and training exercises to fake outs, battle cries, and never-before-played games.